Mansfield Plantation consists of 893.4 acres located on the west side of the Black River, just a few miles inland from the Atlantic Ocean near Georgetown, SC. 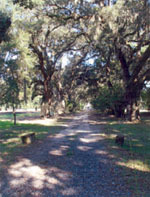 Mansfield Plantation is a National Historic Landmark consisting of 893.4 acres of "antebellum authenticity" located on Black River near Georgetown. It was early in the 1800's that rice plantations near Georgetown began to flourish and created some of the wealthiest colonists in the country. Over 100 slaves worked at Mansfield and many lived in the slave village that still stands today. Mansfield Plantation's main residence was constructed during this time and is situated overlooking the rice fields at the end of a stunning oak-lined driveway. After the War Between the States many of the plantations in the "low country" fell into disarray and by the early 1900's were purchased by wealthy northerners who used them as hunting retreats. 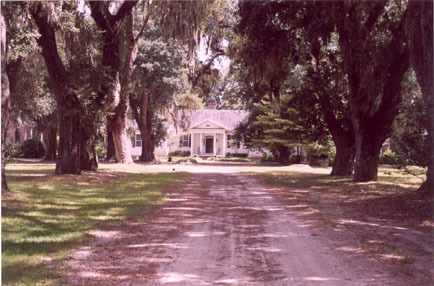 In 1930 Mansfield Plantation was purchased by businessman, Colonel Robert L. Montgomery, of Ardossan, Pennsylvania. Col. Montgomery improved the plantation by renovating the main house, adding beautiful brick bridges along the main driveway, a stable for their horses, a laundry house, and three charming guest cottages. In 1970 the plantation was purchased by Wilbur Smith of Columbia, South Carolina from Mrs. Montgomery. The Smith family often traveled from their Columbia home to Mansfield inviting friends to share holidays and hunting excursions. Mansfield is presently owned and cared for by Sally Smith, who inherited the property from her father in 1995. Mansfield Plantation consists of 893.4 acres located on the west side of the Black River, just a few miles inland from the Atlantic Ocean. The topography is level or gently rolling. The plantation fronts a paved road 3.5 miles north of the historic seaport of Georgetown. After entering the plantation one travels through a gorgeous long leaf pine and hardwood forest for over 1.5 miles to an oak lined section that extends past the old slave village, the stables and pastures and on to the main house and guest cottages that overlook the rice fields. The setting is spectacular. Scenes of Mel Gibson's movie "The Patriot" were filmed here. The main house, built in the early 1800's, is a one story frame structure of understated elegance. It contains hardwood floors, 12 ft. ceilings, entrance hall, living room, large dining room, sitting room, one bedroom, two baths, a modern kitchen and sunroom. Elaborately carved woodwork is found throughout. The old-brick guest cottages have a total of eight bedrooms and eight baths and are situated in formal gardens near the main house. Other improvements include a paved boat landing, stable, fenced pasture, equipment sheds and storage areas. Other historic structures include a slave village, a small church, and the county's only remaining winnowing house, where rice kernels were separated from the chaff. Due to its location and physical characteristics the plantation has obvious development potential. Since there are no conservation easements existing on the plantation, there are substantial tax incentives available to a buyer willing to restrict such a property from future development.